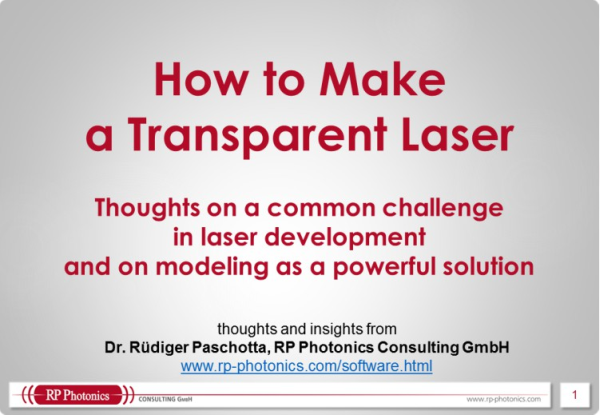 Ask RP Photonics for advice on how to ensure single-frequency operation of a laser, or how to characterize single-frequency lasers in terms of noise. A laser can be made to operate on a single mode of its resonator, and is then called a single-frequency laser. The linewidth of the laser radiation can then be very small – often only a few kilohertz – and the coherence length accordingly long. In contrast, multimode operation causes the linewidth to be a multiple of the mode spacing (free spectral range) of the resonator. Single-frequency operation is required e.g. to drive resonant cavities (e.g. for efficient frequency doubling in an external enhancement cavity), for high-resolution laser spectroscopy, for coherent beam combining of laser outputs, and for applications where the intensity noise must be very low. The emission linewidth can be extremely small for single-frequency operation – far below the longitudinal mode spacing of the resonator, and many orders of magnitude below the gain bandwidth. The theoretical limit is the Schawlow–Townes linewidth, determined by quantum noise. In most cases, however, the Schawlow–Townes limit is very hard to reach, since technical noise influences (e.g., acoustic noise and thermal fluctuations) are difficult to suppress to the required extent. Single-frequency operation is usually obtained when the bandwidth of the net gain is smaller than the frequency spacing of the resonator modes. (The laser should operate on the fundamental transverse mode only, i.e. emit a diffraction-limited beam, in order to eliminate the different mode frequencies of higher-order transverse modes.) For gain media with large bandwidth, single-frequency operation can still be achieved by using some optical filters (e.g. an etalon) in the resonator and/or by making the resonator short (thus increasing the mode spacing to obtain a large free spectral range). Note that reduced mode competition, e.g. inhomogeneous gain saturation caused by spatial hole burning in a standing-wave resonator, can make it difficult to achieve single-frequency operation. Therefore, single-frequency operation is often realized with unidirectional ring lasers, or sometimes with the twisted-mode technique. In fiber lasers and amplifiers, additional problems arise from stimulated Brillouin scattering. It might be expected that intracavity frequency doubling is not readily compatible with single-frequency operation, but the opposite is true: via sum frequency generation, the intracavity nonlinearity even protects the lasing modes by introducing higher losses for other modes. The concept of distributed feedback lasers is often used for achieving single-frequency operation, particularly for semiconductor lasers and fiber lasers. This usually leads to fairly short laser resonators. Thermal drifts, e.g. of the gain medium, can cause occasional mode hopping, i.e. the change from one oscillating resonator mode to another. To a limited extent, this can be acceptable for applications. If a high optical power in a single-frequency signal is required, a master oscillator power amplifier configuration can be employed. An alternative with potentially lower laser noise is injection locking of a high-power laser with a single-frequency low-power laser. The article on single-frequency lasers discusses different types of lasers for single-frequency operation. 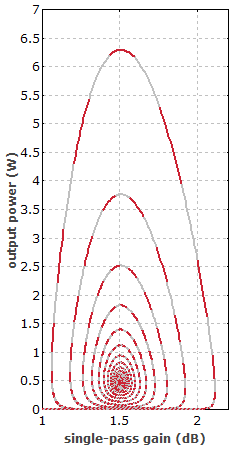 Evolution of output power and gain when an Yb-doped fiber laser is switched on. One can see the relaxation oscillations, with convergence towards the steady state. Each red or gray segment corresponds to 0.2 μs.